A few weeks ago I got some of my Moms furniture. I was super excited about her buffet! I also was able to take some of the plates that use to be up in our family cabin, as well as 1 of my Grandma Irene’s china plates. 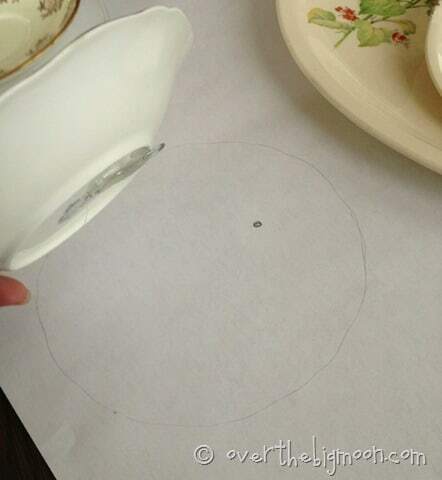 If you remember this post, then you will remember that I had a whole lot of saucers that did not have tea cups to go with them! 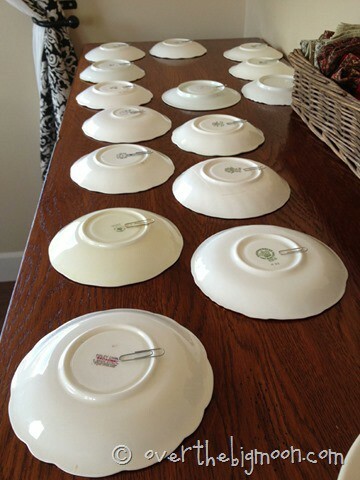 But I loved the saucers and could not throw them away! 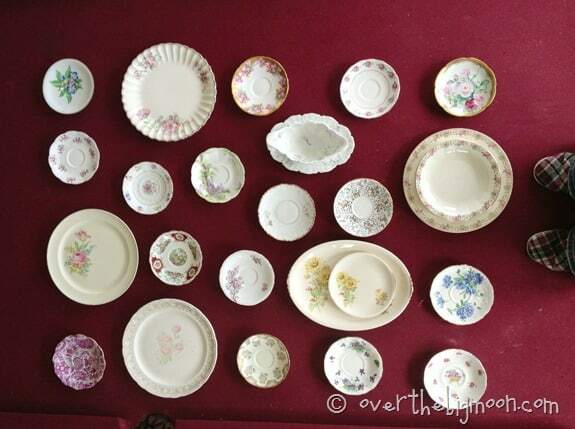 We have no idea where my grandma got all of the teacups and saucers from. I like to think she and her friends had an exchange, or as dear friends passed she took 1 to remember them by. No matter where she got them, I love them! 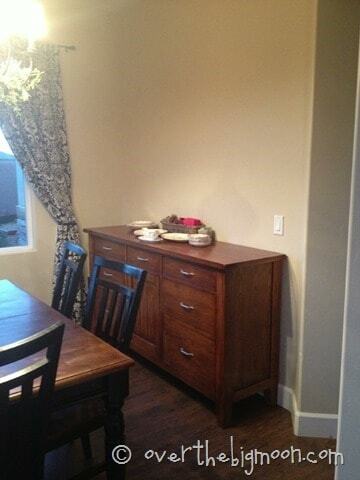 With my Moms buffet in our nook I realized I had a huge wall to work with! 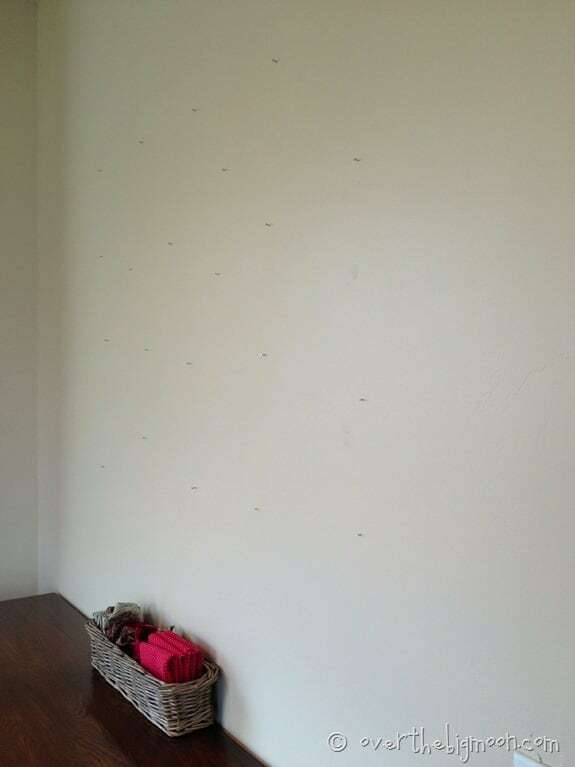 I had just patched all of the holes ib the walls and repainted so the last thing I wanted was to put a whole bunch of holes that I didn’t need back into that wall. I got a plan and it worked with only had 1 extra hole in the whole process! 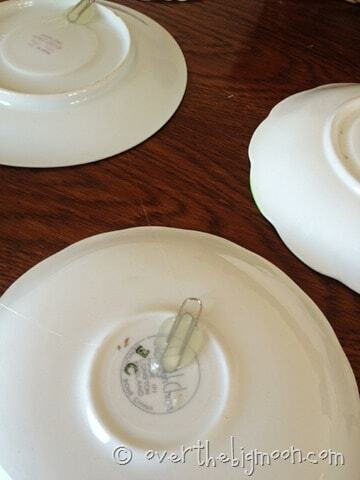 Before I started I added hangers on the little saucers. I used paper clips and hot glue. It works like magic! Lay them all out and place a paper clip over the lip. Then go by with your hot glue gun and fill it all in so the 2/3 of the clip is totally in the glue. Let it dry for about 24 hours before you hang them. 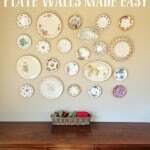 I ordered plate invisible plate hangers to hang the larger plates. Next you need to lay them out. I looked at all sorts of plate walls on Pinterest and decided I liked the look of something that was both neat but not perfectly symmetrical. I did a basic layout on my pool table. I took pictures of it from above so I could see what it would look like head on. Next I took a big piece of butcher paper and laid it on the ground. I moved the plates one by one and placed them on the paper exactly how I had them on the pool table. I ended up moving a couple around…but then moved them back when I put them on the wall. Next I traced around each plate and then I felt where the clip was with my finger and marked as close as I could to where that nail should go. 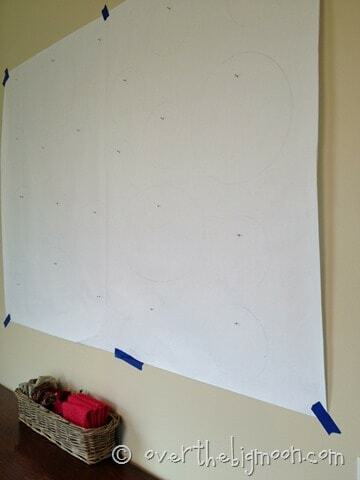 When you have them all traced you need to move them back off the paper. 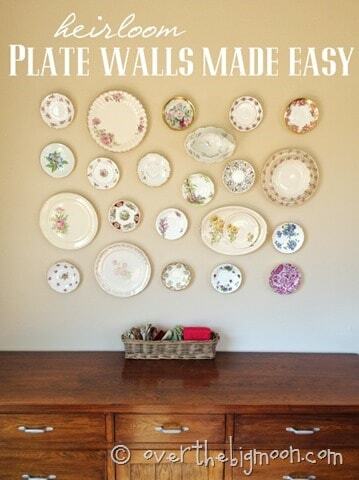 Make sure you lay them back out as they will go on the wall and you will save yourself some time later on! 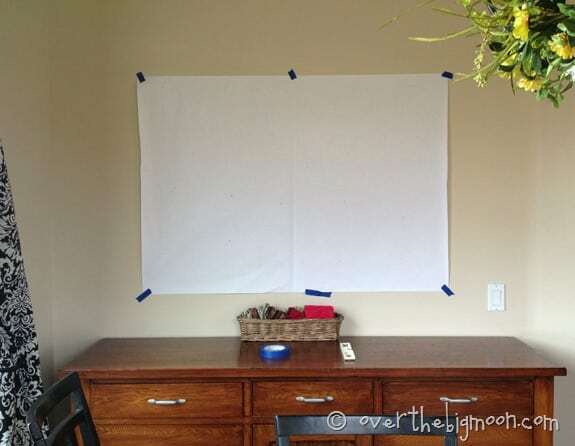 Then using a level and some painters tape I hung my paper up. It was nice because I could adjust its height and make sure it was centered as a group, not individually. Once you have it in place it shows you exactly where to put your nails! I pounded my nails in right over the paper and then ripped the paper off leaving the nails right where they needed to be! I hung my little plates and tried to wait patiently for my bigger hangers to come in the mail. When they finally did I put them on and had to wait another 24 hours! It was worth it to know that these wont fall off the wall and break! I love the way it turned out! The whole room is perfect now! 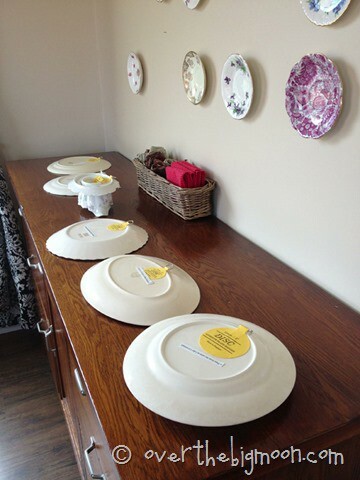 Hi, I just wanted to know If the plates you hung with the yellow hangers are still hanging in there? 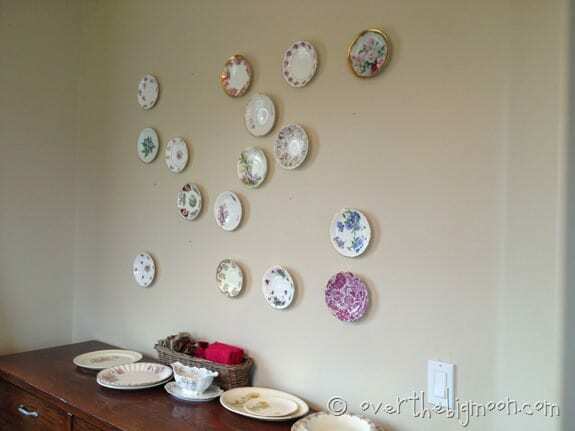 I have started a wall in my dining room with some other plate hangers I bought at the hardware store, but after a week I lost a few that fell. I read the reviews and got mixed reviews on the yellow ones and I just wanted to speak with someone that has had them up for a while. Please let me know, thanks!! This is great! Love your ideas! 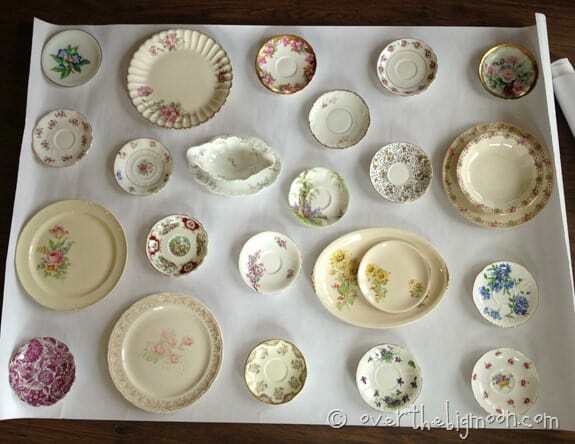 how did you attach the plates with the saucers or smaller matching dishes? Did you glue those together also? Those were like that when I got them from my Mom. It looks like she did glue them. Her choice of glue was usually 527 glue but I cant be sure exactly. Love this! 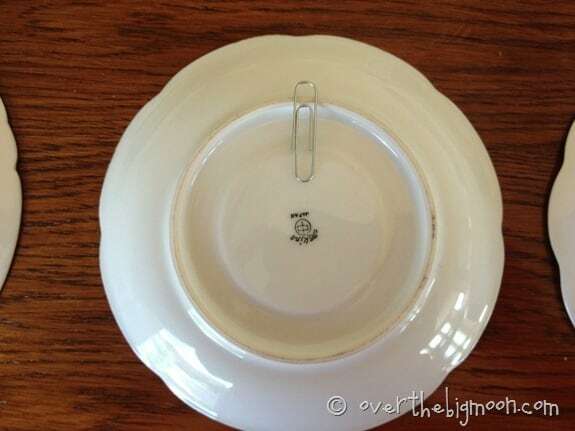 I always see plates at goodwill that I fall in love with, but I always have to pass them up because I don’t know what to do with them! 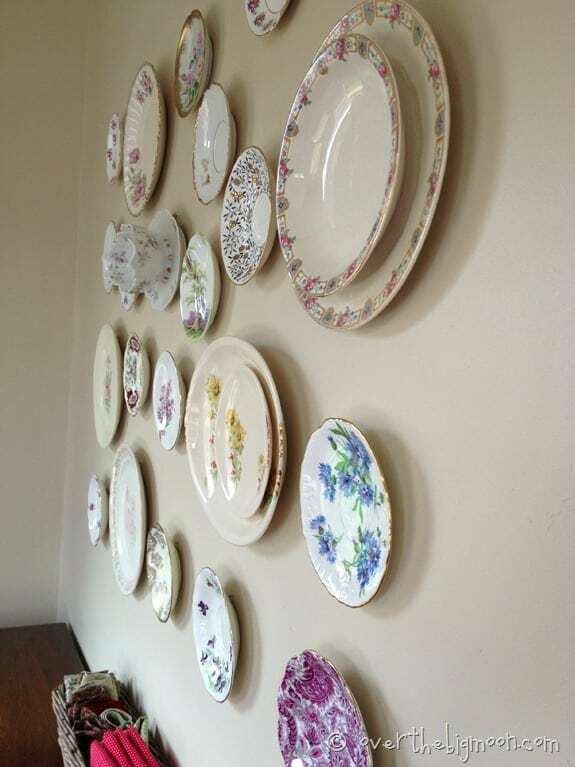 Im going to have to start snagging up those plates to make a wall like this!